One of my fondest memories of my childhood was crayons and coloring books. The crayons were kept in a berry basket on the very top of, what seemed like, an enormously tall wardrobe. Of course I was only six so any wardrobe would have appeared tall to me. Because of their location you had to ask permission to use the crayons and an adult had to retrieve them for you. My grandma would reach up and hand that beautiful basket of crayons to me and it would make me so happy. I would take the basket and my book and sit down on the floor to pour out my inspiration. As an adult, I choose my coloring books with care and color whichever page I want. But as a child the book was chosen for me and I assure you, I colored every page. 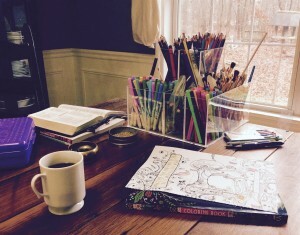 Coloring books usually were purchased at Christmas time and not often otherwise. The berry basket held hundreds of crayons. Problem was that they were usually only one to three inches long and their beautifully colored paper wrappers had long since been removed. It was not uncommon to pick up a crayon and have to make a mark on the inside back cover of your book just to be sure of the color of your chosen crayon. Still these early memories gave me a life-long love of color and paper. It allows the creative side of my brain to take over and the analytical side to take a much needed rest. The purchase of my new coloring books has multiple meanings to me. You see, I feel guilty. I feel guilty taking the time to do something just for me. I feel guilty not working every moment of every day in my self-owned business. I feel guilty because the laundry and the dishes are not done. I feel guilty if I take time away to be still and recharge. The list goes on and on. However, I have come to the conclusion that I cannot be the best me without a break! So I buy these new coloring books with the promise that I will allow myself have some time to recharge. I will be using them during my devotional time in the morning because that is when I feel the most inspired and still. I wonder if all women face this same problem? Do we all feel guilty that we are not completely submersed in busyness all the time? Give yourself a break. Take some time to be with God, read His Word, and pray. Take some time to read a book. Take some time to knit or sew. Take a walk or a run. Whatever is your thing that helps you recharge. Give yourself permission…and you will be a better you. I used to love colouring when I was younger and should invest in an adult colouring book. Yes I feel guilty when I’m taking time out but looking back at last year I regret this decision to not take more me time. This year has started off differently with me focusing on health and exercise. Every day I walk. I have two grandsons and you are right…every moment counts. Enjoy while you can. I was reading your blog as you were reading mine. I admire your stick-to-itiveness regarding your focus on health and exercise for the new year. I think I’m gonna take up bike riding as soon as weather permits. Thanks for the encouragement.